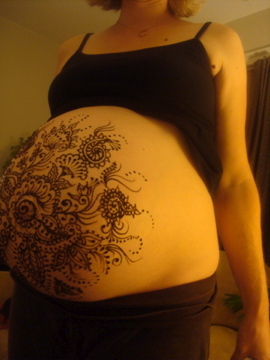 Our friend Mary came over last night to create this amazing design with henna on my very large canvas of a belly. It’s something I’ve been wanting to do to celebrate this pregnancy and the impending arrival of our little girl. I told her I wanted something on the big side and free-flowing, other than that, she was on her own. Pretty amazing, isn’t it? Most of the henna has crumbled off by now, leaving a light orange stain on my skin. Last night it looked like chocolate, though smelled nothing like chocolate. Good thing too, as I would have eaten it right off my own belly. Classy. Big shop update today if you care to stop by. Also, on the subject of fun thrifted goods, I have some things to share with you. Things that I’ve found lately for myself that I have questions about. I just know you’re the right people to ask. Tomorrow. I’ll show and tell tomorrow. This entry was posted on Monday, November 10th, 2008 at 5:07 pm	and is filed under Misc.. You can follow any responses to this entry through the RSS 2.0 feed. You can leave a response, or trackback from your own site. Whoa, that is soooo cool!! That is a totally awesome tummy! I think the little girl in there is pretty happy right now! I love the henna on your belly, it is such a great idea, sooo pretty! I am packaging up your swap package up today, it will go out in tomorrows mail! wow. that is like something out of a fairy tale. beautiful. What a great baby belly shot! Your belly is absolutely beautiful. I love henna but for some reason I didn’t have any belly henna. I do have a cast though. Your store looks lovely and I’m so pleased to see your vintage children’s books. Always a favorite for me.